Passengers about to depart from Lagos airport, Nigeria, are being checked for their body temperature to make sure they don't have fever, one symptom of Ebola. “The time to act in a swift, coordinated and powerful manner is now,” General Assembly President Sam Kutesa told the 193-Member body ahead of a vote on a resolution. “Without quick and decisive action, the trail of devastation this outbreak leaves behind will reach far beyond the portions of West Africa most affected up to now,” he added, stressing the Ebola is not a sub-regional or even regional calamity, but an international crisis. The virus killed at least 2,500 people in West Africa and nearly twice that number have been infected, according to the UN World Health Organization (WHO). The number of cases is doubling every three weeks. Women are particularly at risk given their roles as primary caregivers and community leaders. In Liberia, an estimated 75 per cent of fatalities are women, while in Sierra Leone, that number is around 59 per cent. “Women are much more likely to be front-line health workers,” Mr. Kutesa said, underscoring the heightened risk that they face. The Assembly unanimously agreed through its resolution to harness capabilities and competencies across the UN system in a single, unified structure to ensure a rapid, effective, efficient and coherent response to the crisis. 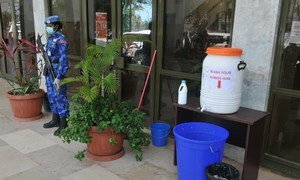 The body’s decision comes a day after the Security Council passed its resolution which declared the Ebola virus outbreak a threat to peace and security. Secretary-General Ban Ki-moon has announced the establishment of the UN Mission for Ebola Emergency Response (UNMEER) to stop the outbreak, treat the infected, ensure essential services, preserve stability and prevent further outbreaks. Mr. Ban spoke today with Ghanaian President John Dramani Mahama, who expressed support for UN efforts to headquarter UNMEER in Accra, with offices in the three most affected countries. The country’s international airport will be used as a “vital air bridge,” Mr. Ban confirmed. Briefing the General Assembly, he noted that the Ebola crisis, which started as a public health emergency, has taken on a wider scope with significant economic, social, humanitarian, political and security dimensions. Among recent international announcements of solidarity, the United States has said it would deploy 3,000 troops to provide expertise in logistics, training and engineering. The Government of Cuba plans to send a 165-member team of doctors and nurses to the region, while a 59-member Chinese laboratory team left for Sierra Leone earlier this week. “I hope other Member States, along with the private sector and civil society, will do far more,” Mr. Ban said, adding that he looks forward to “strong and rapid support” for UNMEER, and the countries and people in need of critical aid. Earlier this week, the UN outlined a set of critical needs totaling almost $1 billion over the next six months. Speaking to journalists after the meeting, Mr. Kutesa said the General Assembly had added “a powerful voice” to the Security Council in adopting the resolution. “Inaction is not an option,” he reiterated.